"Goldie" arrived on New Year's Day 2014! 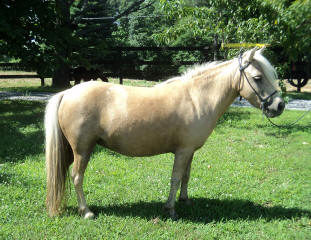 She is a beautiful mare and has excellent floaty movement, great conformation, and a very sweet disposition. 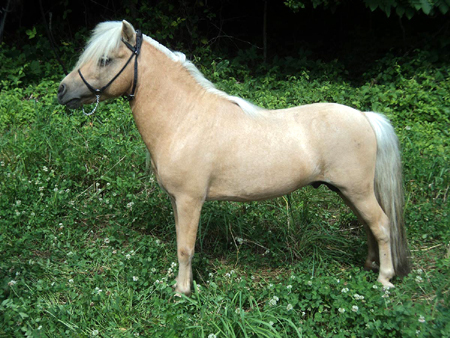 Goldie was bred to a stunning stallion, Little King's BTU Buck Et of Gold, for a 2014 foal. 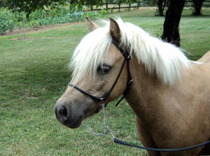 The stallion, "King" (pictured below) that is bred to Goldie, is also a beautiful rich Palomino stud who stamps his babies with his sweet disposition, way of going, and excellent conformation. King's sire Ima Boones Little Buckeroo Too, definitely contributed his excellent bloodlines to King and his get. King's dam is also from Little King's Farm and her name is Little King's Dream Duchess, a lovely broodmare, born in 1989. 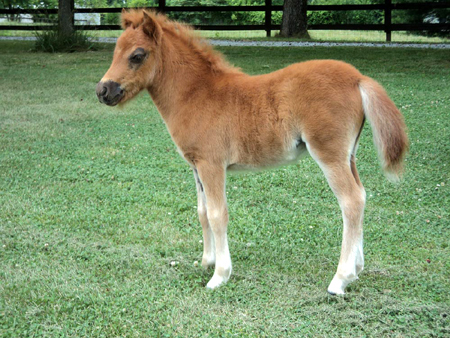 King, who stands at 31.5", and was born on April 16, 2002, was bred to Goldie in 2012 and the pairing produced a rich cherry chestnut filly, Spotted Dreams Red Lady (DOB 4-24-12). Red Lady (pictured below), is a lovely filly with long legs, a beautiful face and very nice conformation. She is a sweetheart of a baby, and so friendly too! No pictures taken by D. Robison may be used or duplicated without the written consent of Hickory Springs owners, the Robison Family.